One of the epitomes of high style 1960’s architectural design is Eero Saarinen‘s 1962 TWA Flight Center shaped like a flying bird. Mr. Saarinen was born in Finland and his architectural firm was based in Detroit. One of the greatest gifts he ever gave to New York City’s Kennedy Airport is this ‘Mad Men’ era TWA Flight Center building. You can just see women with pill box hats, gloves with matching shoes, elegant suits and hat boxes arriving for their journey abroad. The open design is one of fluidity, your eyes are made to sweep across this magnificent airy space. The terminal ceased operations in 2001 but has thankfully been declared a historic landmark. I was privileged enough be given a rare private tour to experience the genius and beauty that is Saarinen. This entry was posted on June 22, 2013 by newyorkcityinthewitofaneye. 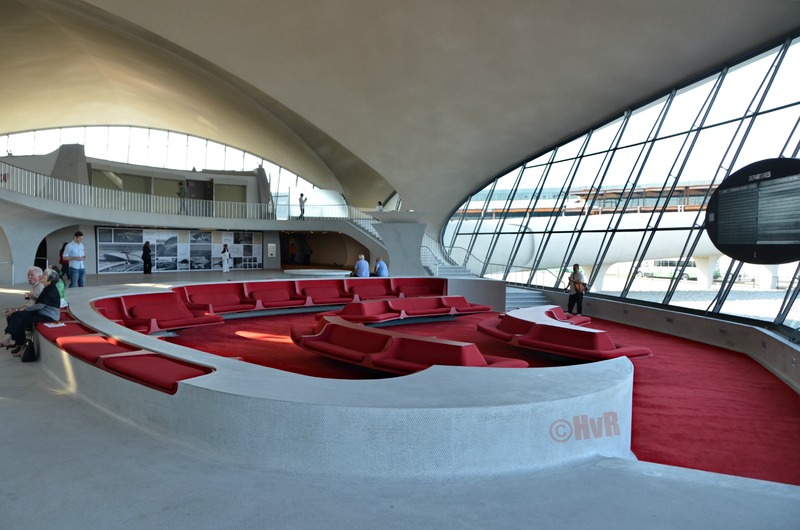 It was filed under DAILY PHOTOS WITH STORIES OF NEW YORK CITY and was tagged with 1960's architectural design, 1962, aviation, bird-like building, Eero Saarinen, fluid design, Hans Von Rittern, historic landmark, Kennedy Airport, Mad Men era, Manhattan, New York City, open airy design, Photo of the day, Queens, red white design, retro airlines terminal, Trans World Airlines, TWA Airlines, TWA Flight Center. You should see the rest! I am working on a separate page on my Web site or album on Facebook, I have about 1,000 photos to edit . . .